While Lake Toba is breathtaking enough to be worth a visit on its own, the region near Medan in north Sumatra (Indonesia) has many other stunning surprises in store. With the little time we had left, we visited 2 of the more well known ones on the way from Lake Toba back to Medan, spending a night at Berastagi in between. From Parapat (Lake Toba), it is possible to get to Lake Toba/ Berastagi by public transport. 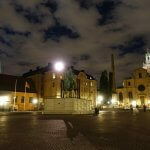 However, as it involved many transfers we opted for the easier option by private car. Cecilia from Smiley’s Homestay helped us arrange the transport from Parapat to Berastagi, with a stop at Lake Toba, for roughly 700,000 IDR by private car. After almost 3 hours driving along Lake Toba with clear blue skies, the road turned inland towards Berastagi. Clouds started to gather and a light drizzle had formed by the time we got off the car. I had read a lot about the spectacular 120m drop of Sipisopiso, but seeing it in person was nonetheless a jaw-dropping experience. 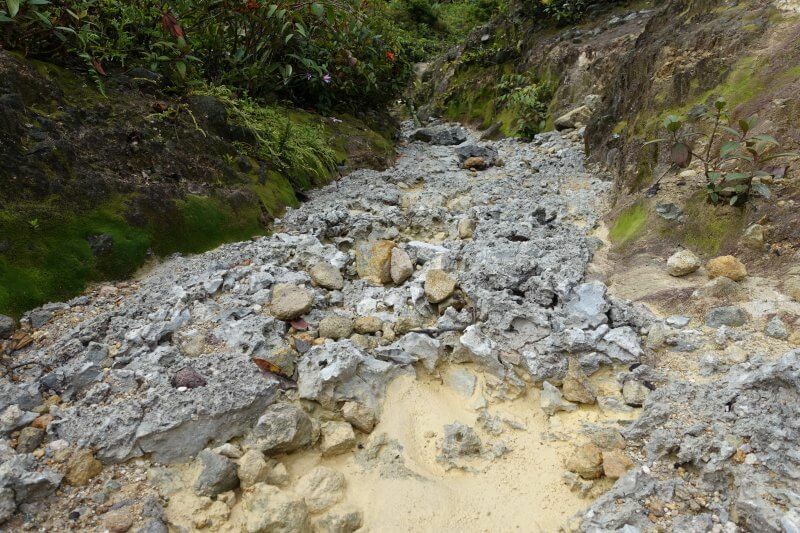 From the top, it looked as though a peaceful open plain suddenly had been ripped open, exposing the rocks underneath as well as an underground river which now had nowhere else to run. If there ever was a spot for treasure hidden by the gods, the base of the waterfall has to be it. View of Sipisopiso waterfall near the carpark/ entrance/ start of hiking trail. Fields and villages on the edge of the cliff in the light mist add a mystical air around the falls. 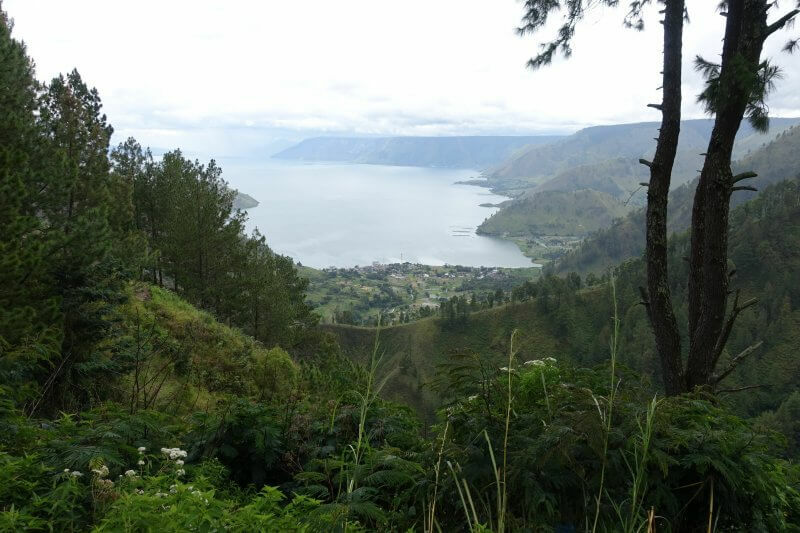 We had one last glance at Lake Toba (after all those days by the lake) from the top of the trail to the waterfall. Sipisopiso waterfall lies near one end of the massive lake. 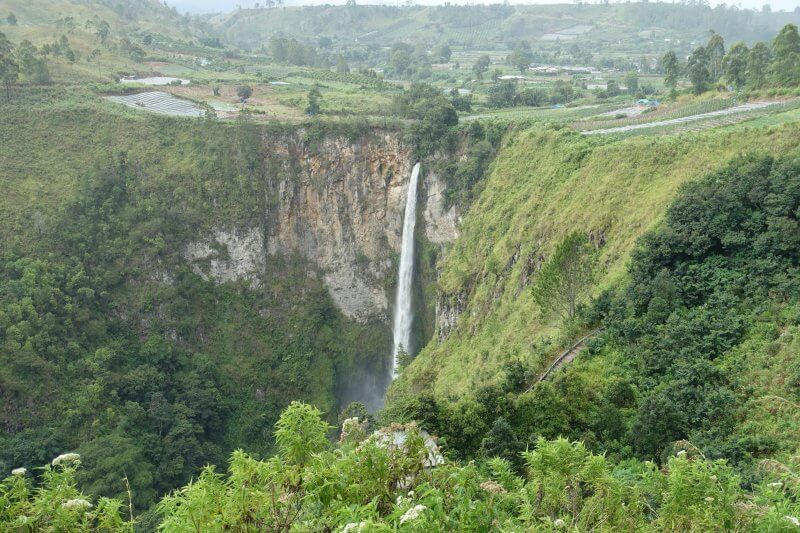 Lake Toba, from Sipisopiso waterfall. Slowly but surely, the trail winded down towards the bottom. It’s not a particularly challenging trail but it can get tiring with the stairs. In any case, the waterfall is almost always in view, so any time is a good time to stop, catch your breath, and enjoy the view. Sipisopiso waterfall disappearing behind the trees near the middle of the trail to the bottom. Near the bottom, the trail follows the outlet of Sipisopiso, a fast moving river lined by trees straight out of Jurassic Park. Could be a setting for Jurassic Park. Would be a nice spot to sit and wait for dinosaurs. Except that at the bottom of the valley it may be hard to run out. At the bottom, even some distance away on approach, you can start to feel the force of the waterfall. Strong winds and the splash from the base coated everything in a thin mist. As I got closer, drenched was an understatement. For the sake of future photos this was as close as I got before keeping my camera safe and dry. 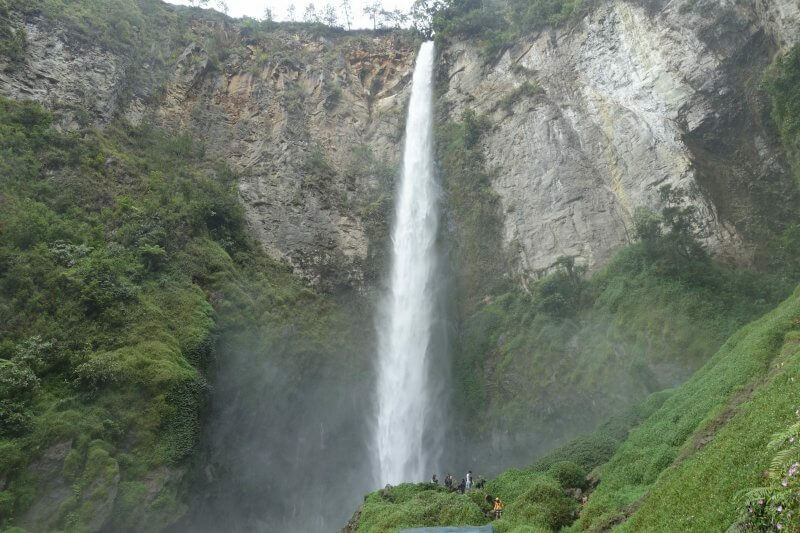 Getting up close to the base of the waterfall is quite an experience, feeling the power of Sipisopiso waterfall. Near the bottom of Sipisopiso waterfall. You can get much nearer, but it would be a good idea to keep electronic equipment clear. We spent about an hour and a half getting to the bottom and back up (comfortable strolling pace). Our cheerful driver was waiting for us near the end/start of the trail with a big grin on his face. 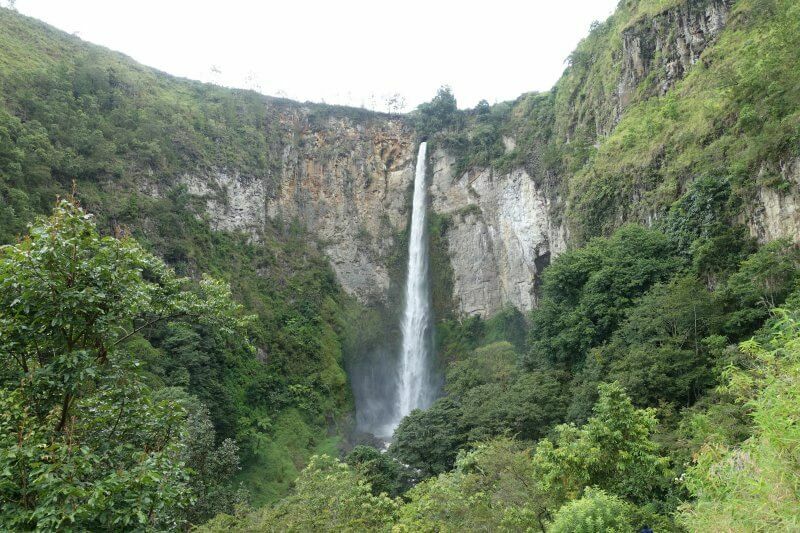 As far as waterfalls in the region go Sipisopiso is in a league of its own. We were as glad to have seen it as he was to see us. Of course we were glad to see him again too. It was a good workout, and time for us to get to our guesthouse for the night. There weren’t many options at Berastagi on Booking.com, and we decided to take the chance with Smiley’s Homestay, a relatively new listing when we booked. All concerns we had with our accommodation for the night turned into a sense of pity that we couldn’t spend more days here on this trip. Cecilia and Smiley (that’s really his name) recently opened their home to tourists, with a room on the second floor that should comfortably fit up to 4 guests. They were warm hosts (and Smiley an exceptional guide too), ensuring that our stay was comfortable and that we felt at home (in theirs). After settling down at Cecilia and Smiley’s home, we went out exploring the Berastagi a little, as Cecilia prepared dinner. View of Sibayak volcano from Berastagi. 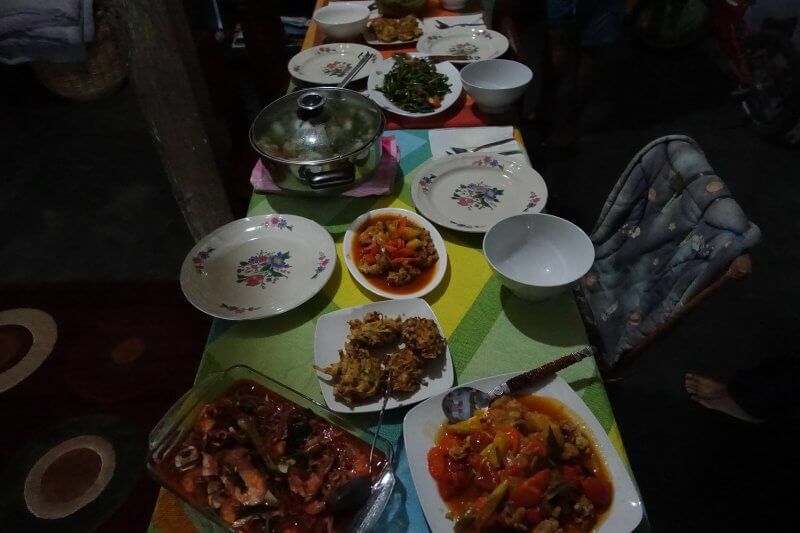 Cecilia cooked up a feast that night with various local dishes. We really couldn’t have asked for any better hospitality, and enjoyed every last bit of the delicious dinner. Smiley arrived home just as the food was ready, with him 2 guests which he had brought around Berastagi for the day. 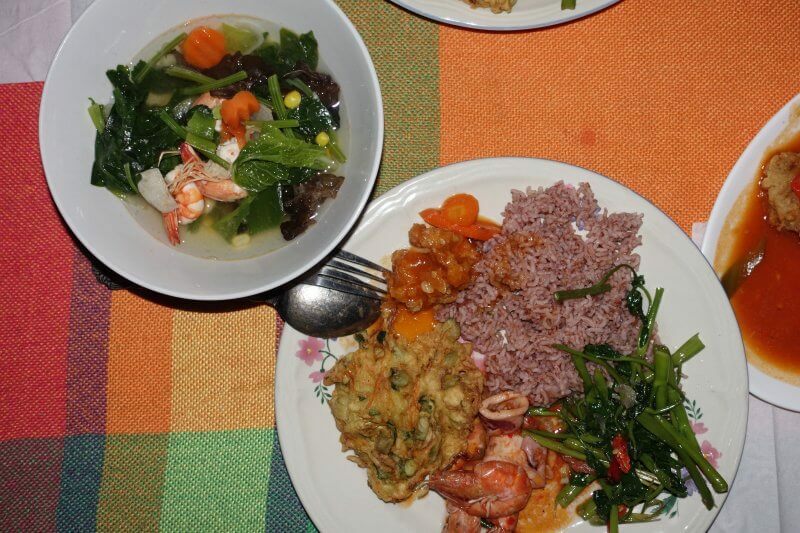 The amazing spread the Cecilia prepared for us, at Smiley’s Homestay. I thought it’s pretty amazing how Cecilia managed to prepare all the food on her own. Smiley added his touch when he arrived by making guacamole from Berastagi avocados. The guacamole went perfectly with the vegetable fritters, but towards the end I was eating the guacamole on its own. Closer up with the dishes. We had an awesome meal and great time chatting with Cecilia, Smiley, and the other guests till it time to call it a day. Perhaps the only less than comfortable feature at Smiley’s Homestay was the lack of a hot shower, but the warmth of their hospitality should be more than enough to make up for it. 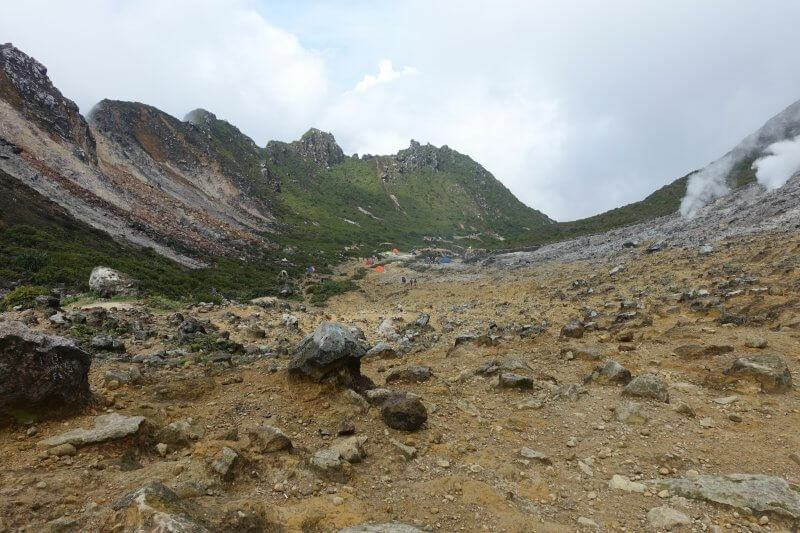 There wasn’t a need for fans or air conditioning that night, as Berastagi, at almost 1,500m above sea level, is chilly at night. Cold enough in climate to grow strawberries and avocados too. The next morning we woke up to clear blue skies stretching all the way to the mountains and beyond. 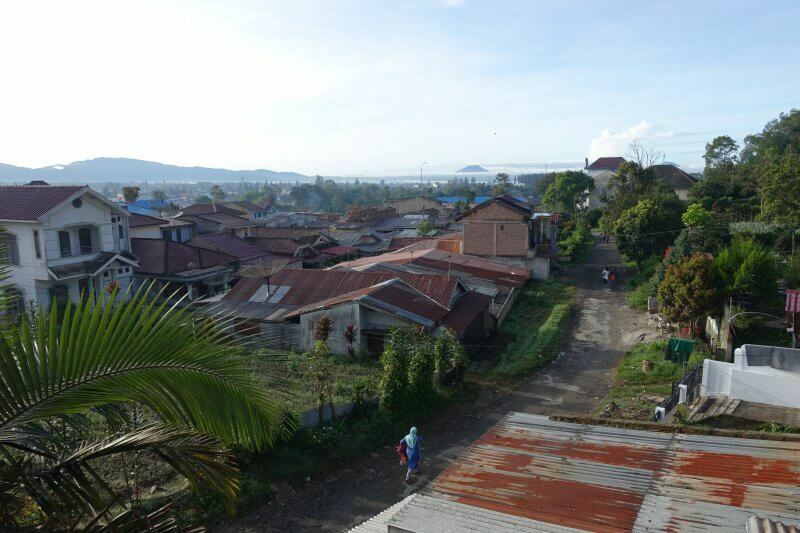 Morning view of Berastagi from Smiley’s Homestay. Downstairs, a simpler but no less amazing set up awaited for breakfast. 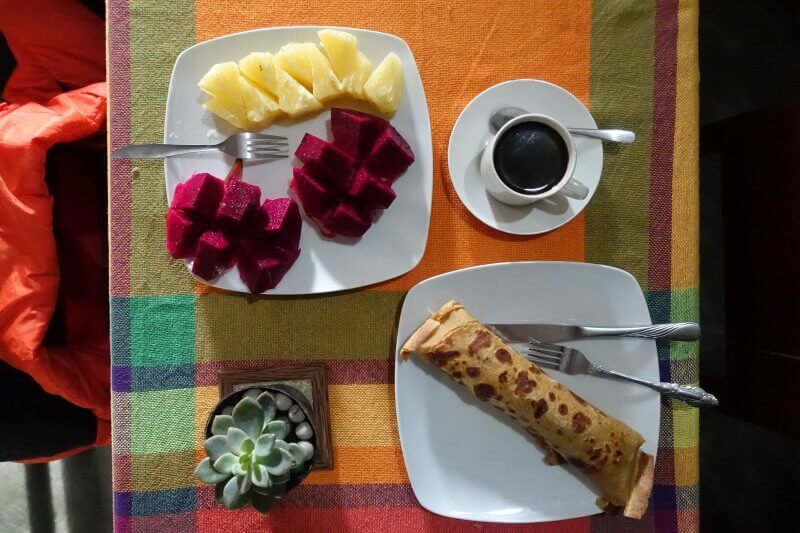 Breakfast was really yummy and provided us with the energy we needed for the hike ahead. 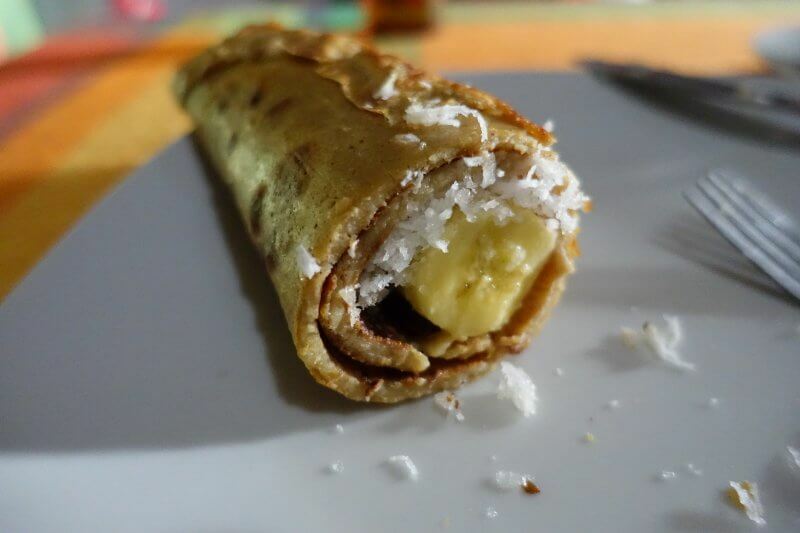 Banana and coconut crepe by Cecilia. As it turned out, the guests at dinner on the previous night had planned to go to Sibayak volcano with Smiley, and Smiley’s van could take the rest of us too. 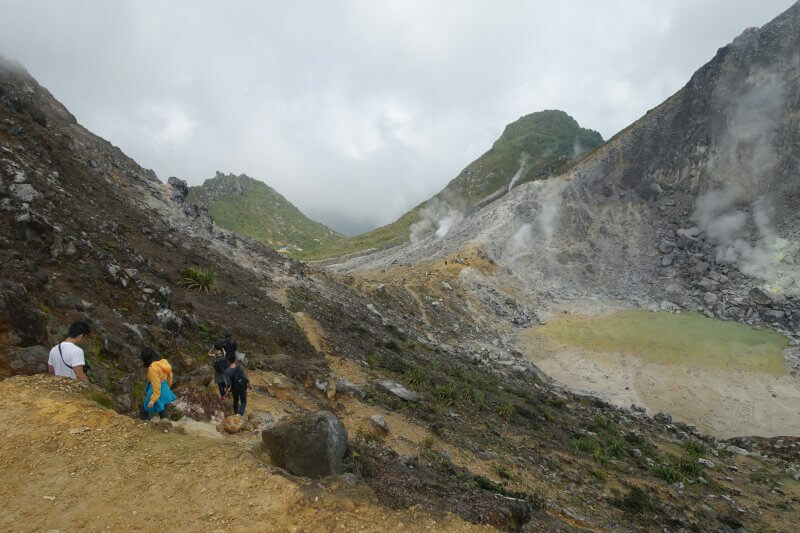 Smiley offered the guided hike to Sibayak, including transport, at 200,000 IDR as of April 2018. Smiley is an awesome guy, and with his experience with the mountains it would have been hard to find a better guide. After all, he has much experience as a volunteer for rescue missions in the mountains, so we were in safe hands. So, with them graciously welcoming us to join, we all ended up a bigger group on a bigger adventure! On the way to Sibayak volcano Smiley stopped on the slopes of Bukit Gundaling in Berastagi. 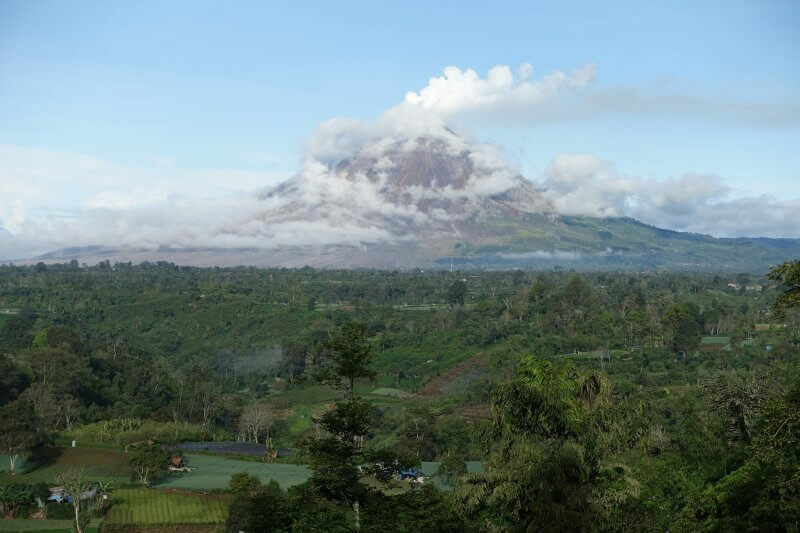 From there we had commanding views of Sinabung volcano, the smoking hot sibling of Sibayak which cannot be climbed with its ongoing eruption. 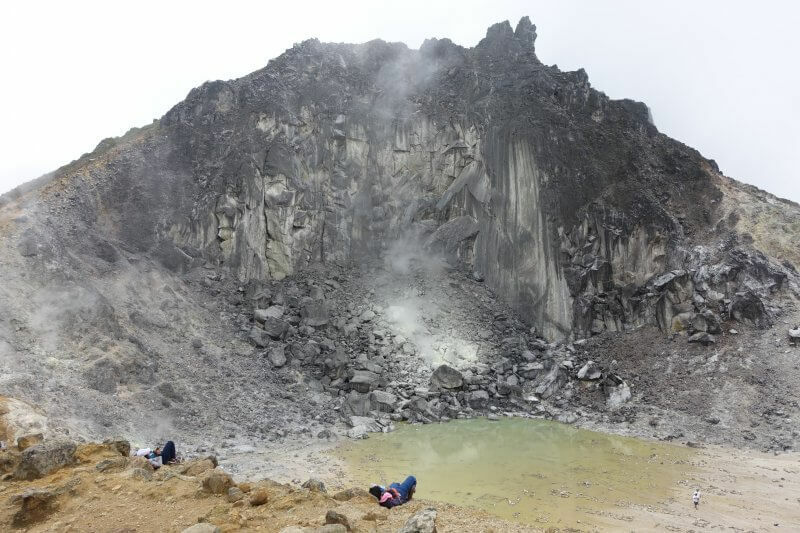 Gunung Sinabung, like a smoking gun. From the other side of Bukit Gundaling we could see Sibayak volcano, which we were to hike to in abit. 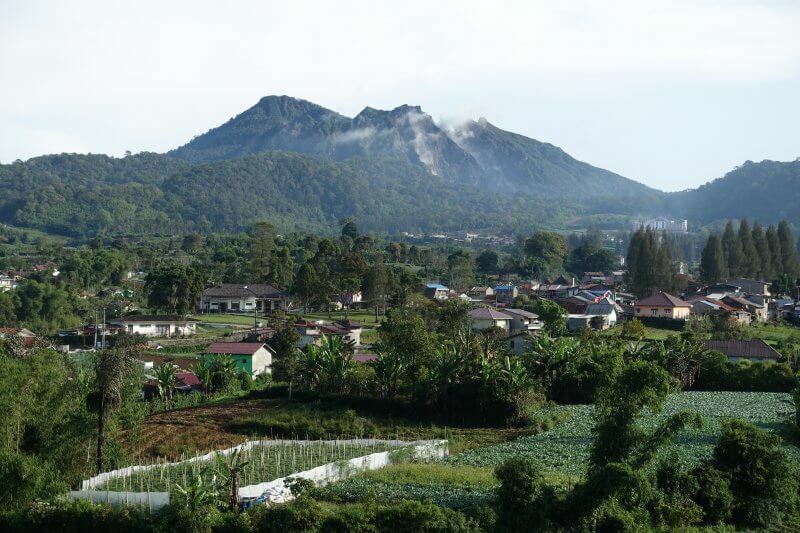 It was smoking but nowhere near that of Sinabung. Gunung Sibayak from Bukit Gundaling, Berastagi. A short drive later Smiley stopped at the carpark, and our hike began. 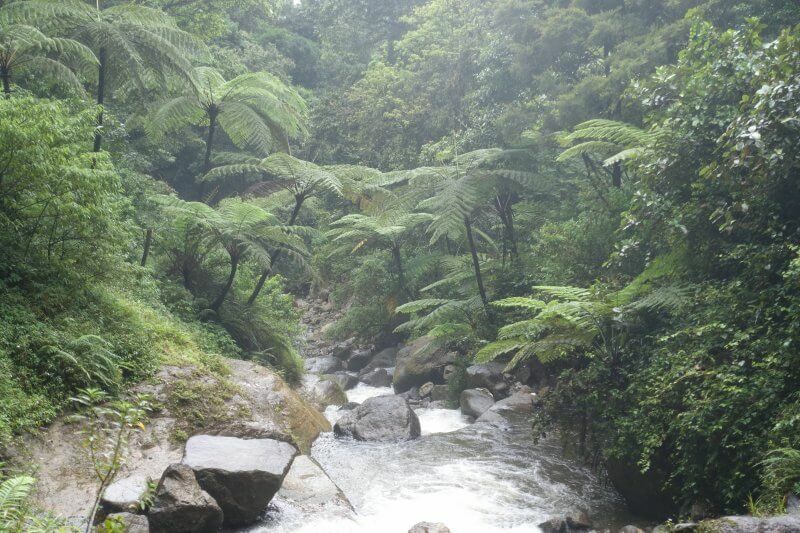 The first part was mostly through the rainforest. 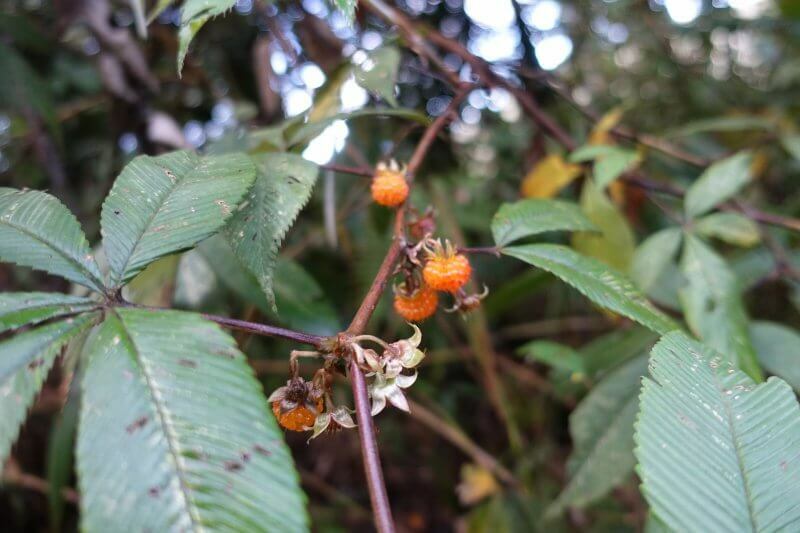 Smiley introduced special plants and fruits along the way, such as a plant which leaves can be crushed to produce an insect repellent, as well as berries that are edible. After about half an hour tall trees gave way to shorter shrubs and the raw rocky landscape of the caldera came into view. 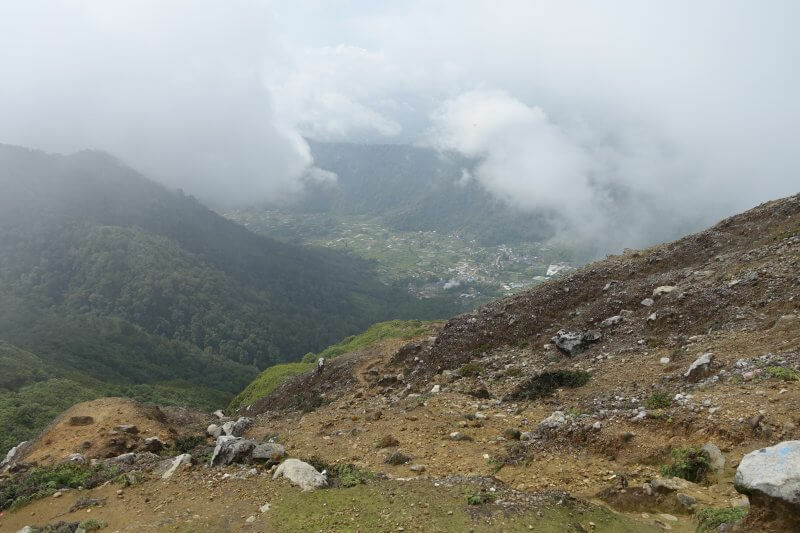 Towards the caldera of Gunung Sibayak. And things got more interesting. Here’s a lava flow that has since cooled and is crumbling. Lava flow after cooling down. 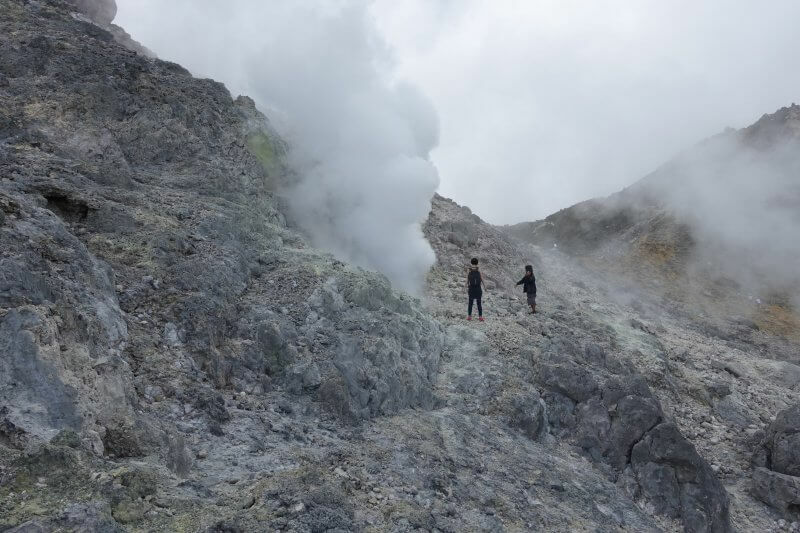 Reminiscent of Kawah Ijen, the sulphur vents on Gunung Sibayak made this feel like a totally different planet. Sulphur vents and the grounds where nothing can grow on. The sulphur vents were loud. Not loud like a jet plane but close. According to Smiley these vents often appear then disappear, then reappear somewhere else. Sometimes, none of them appear. 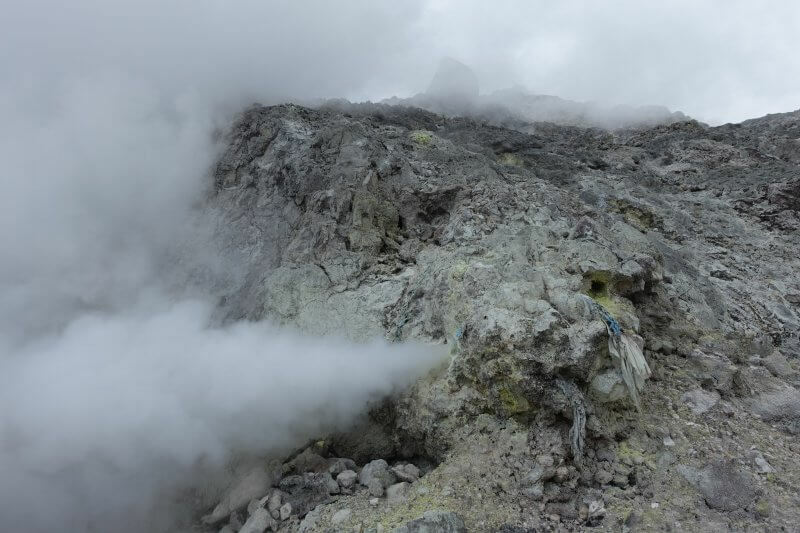 Up close with a sulphur vent. Finally, staring down at the caldera. 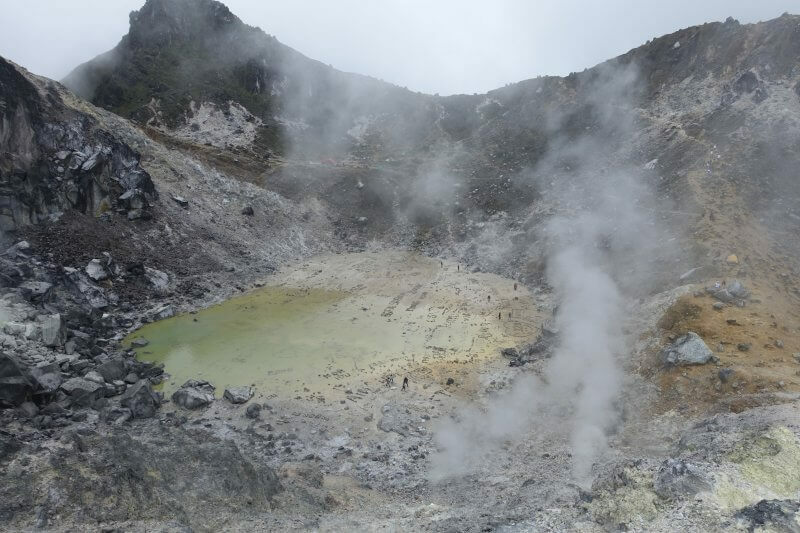 The water may be dangerously acidic due to the high sulphur content so it is a good idea to keep away, though there are some who venture deep into the waters. 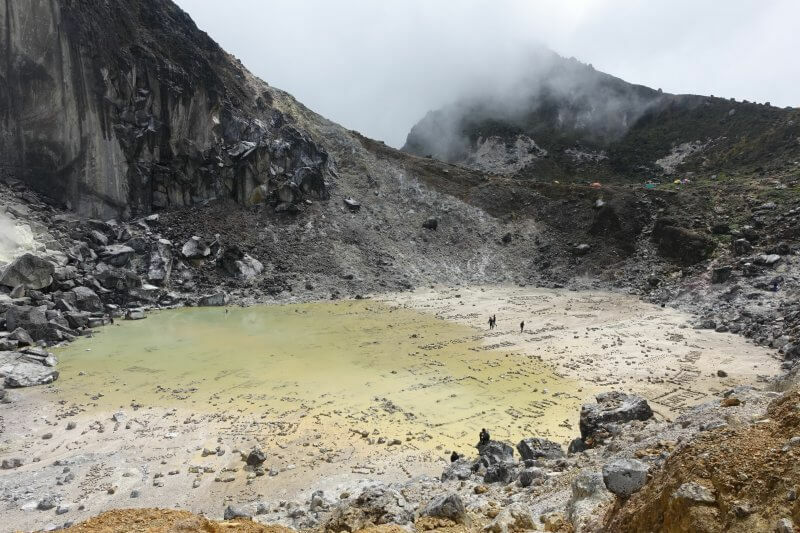 Caldera of Gunung Sibayak in calmer times. 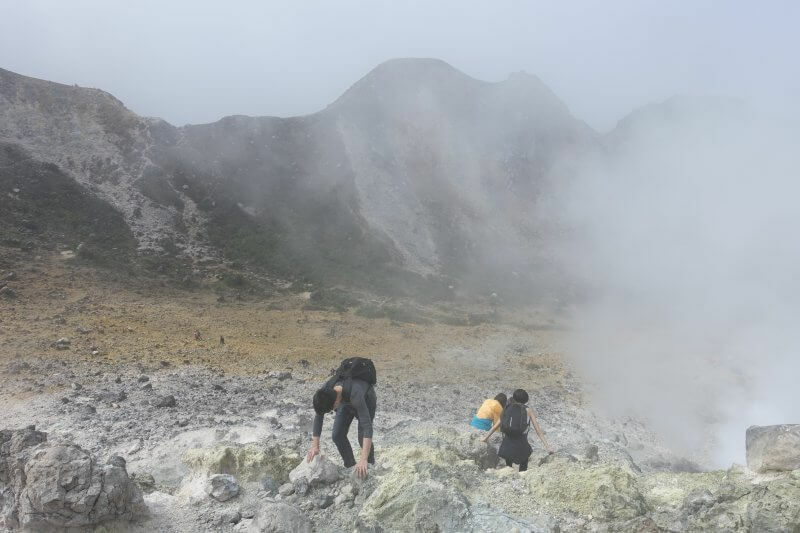 Climbing down one of the higher parts of the caldera to get to the other side. 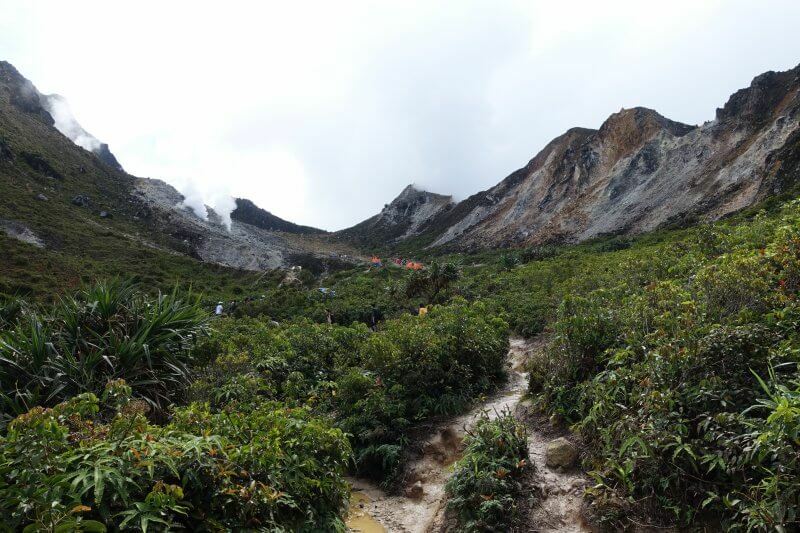 Closer to ground zero, Gunung Sibayak. 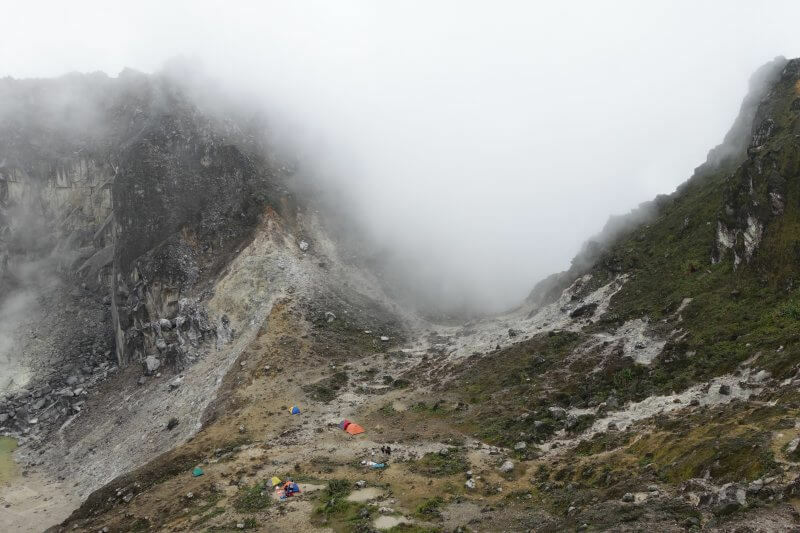 There seemed to have been many groups of locals camping along the trail towards the caldera of Gunung Sibayak. With so much sulphur around I’m not sure if it’s a good idea though. Camping among treacherous looking terrain. Weather was less scary than it looked. Or perhaps it felt less scary with many people around. 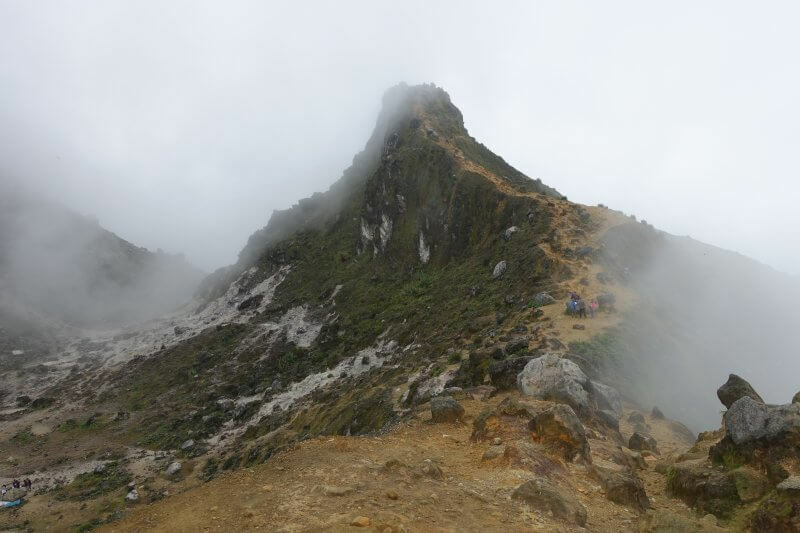 The trail went on further but this was as far as we went, good enough to catch all the views of Gunung Sibayak, and some of its surroundings. Oh misty eye of the mountain below ..
As the thick clouds cleared we caught a glimpse of the villages below. Civilisation, a long way away. Had a healthy dose of camwhoring, snacks and drinks at the top and soon it was time to leave Gunung Sibayak for civilisation once more. Looking in the other direction, the scenery was quite different, with much more life covering the rugged slopes. With a short drive we were back in Berastagi. The whole trip took about 4 hours from Berastagi and back. 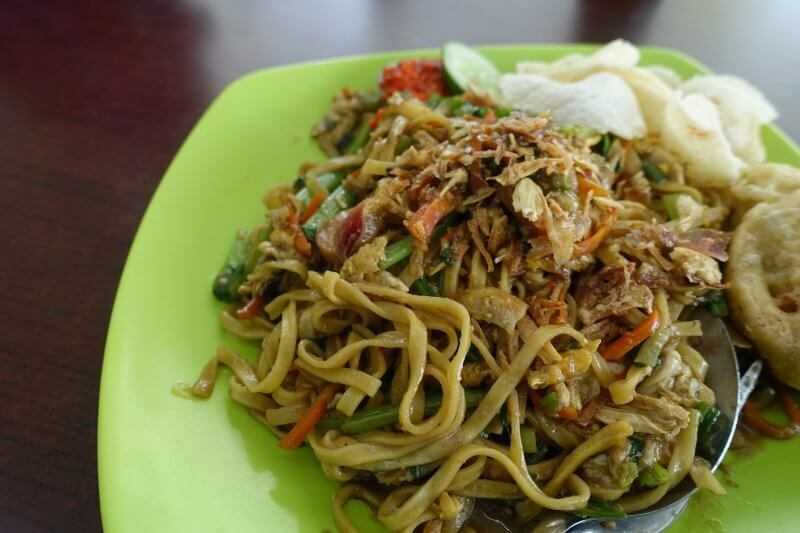 We were famished from the hike and went out in search of lunch, before a quick look around Berastagi. 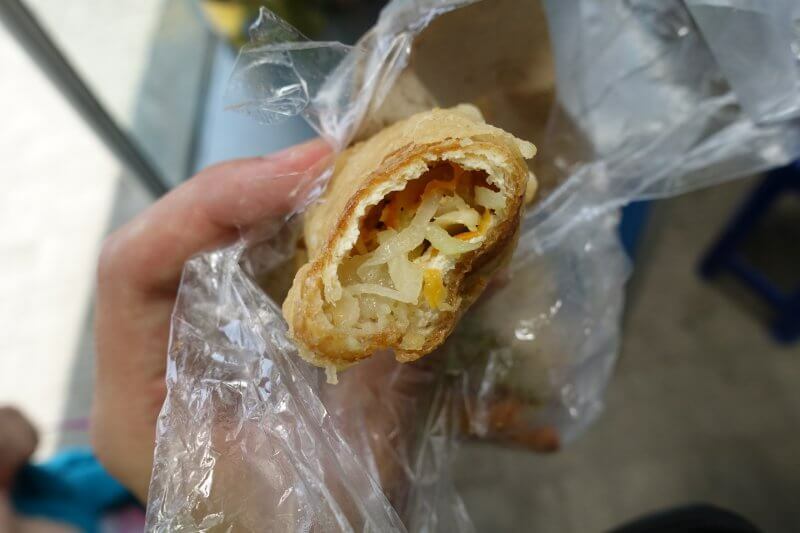 Smiley recommended that we tried m-peh m-peh (um peh um peh) from a stall near his place. Unfortunately by the time we got there it was sold out. I think it is made of some fritters in a special sauce. Fortunately there were other fritters available, as well as the usual Indonesian fare of mee goreng (fried noodles), nasi goreng (fried rice), and more. The food cart selling a surprising variety of food for its size. 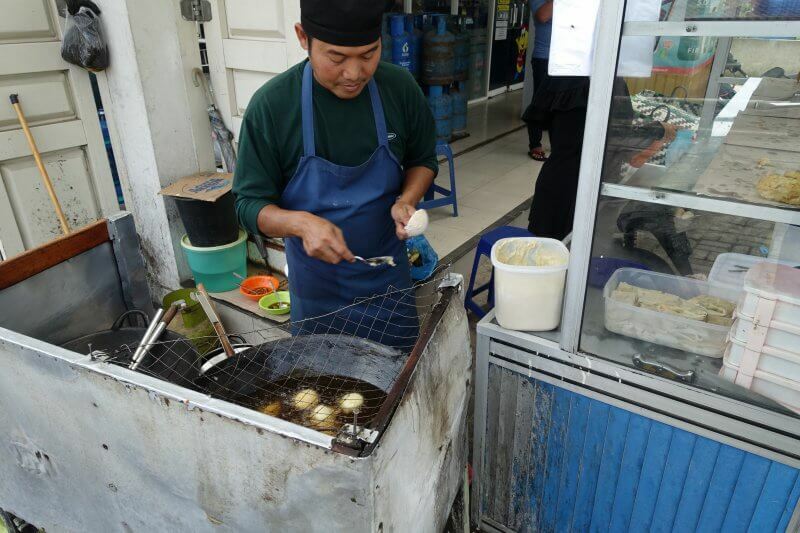 The stallholder continued to make different kinds of fritters throughout the time we were there. There were so many different varieties I doubt he went back to the same thing twice. 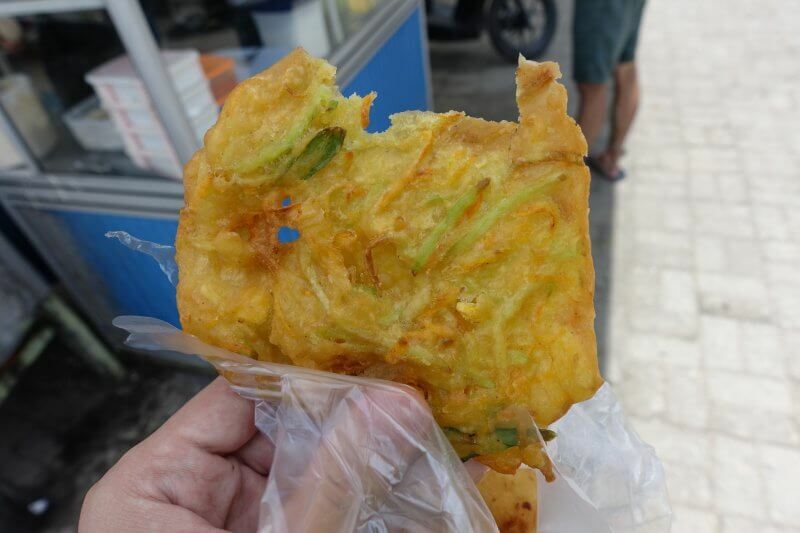 From the first picture at the stall you can see a variety of fritters on display, each of them going for 1,000 IDR (0.10 SGD or 0.07 USD). I got one of each that was available, but by the time we were done with lunch it was another whole different range on display. Here are some of those I tried. This one was sweet, with some pandan-like filling inside. 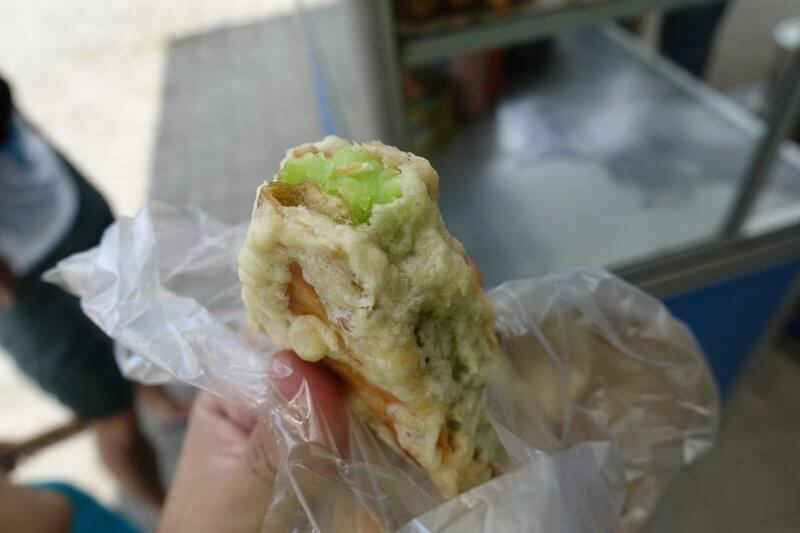 This was sort of a beancurd filled with vegetables. Super delicious too. We ended up getting mains too and having it in the Alfamart behind his stall, which had a sitting area. The Alfamart was really convenient for getting some snacks and drinks too. Fried ee fu noodles (ifumie? ), 12,000 IDR. After having so much food it was the perfect time for a walk around Berastagi. 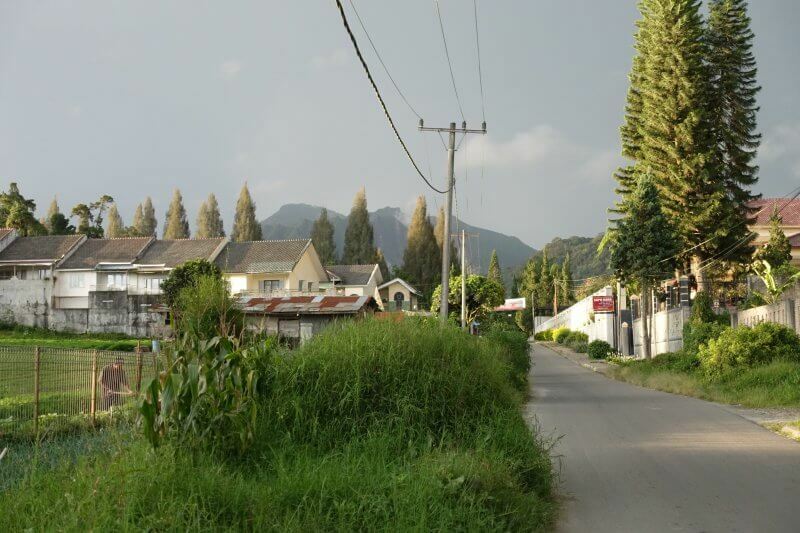 Berastagi is pretty much what you’d expect from a village in the mountains. 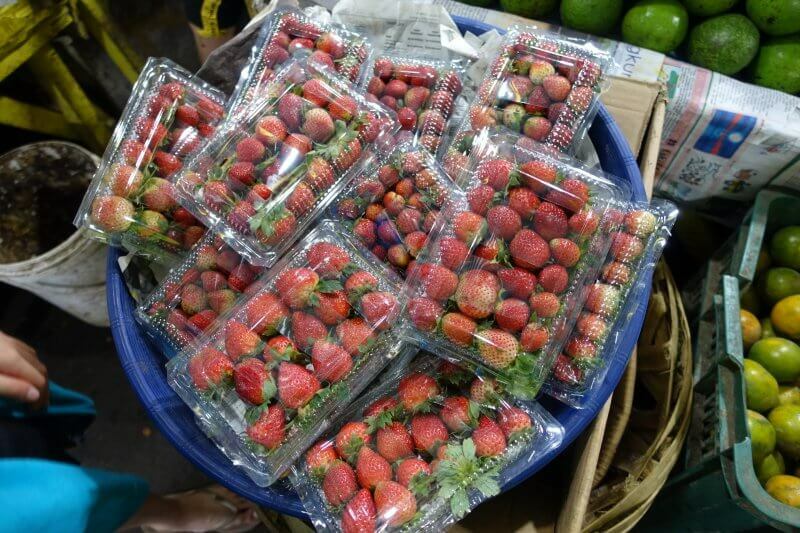 At that altitude though, and with the volcanoes nearby, the fertile grounds are great for growing a variety of crops, and this special characteristic of Berastagi shows up at the local fruit market (pretty tourists oriented). 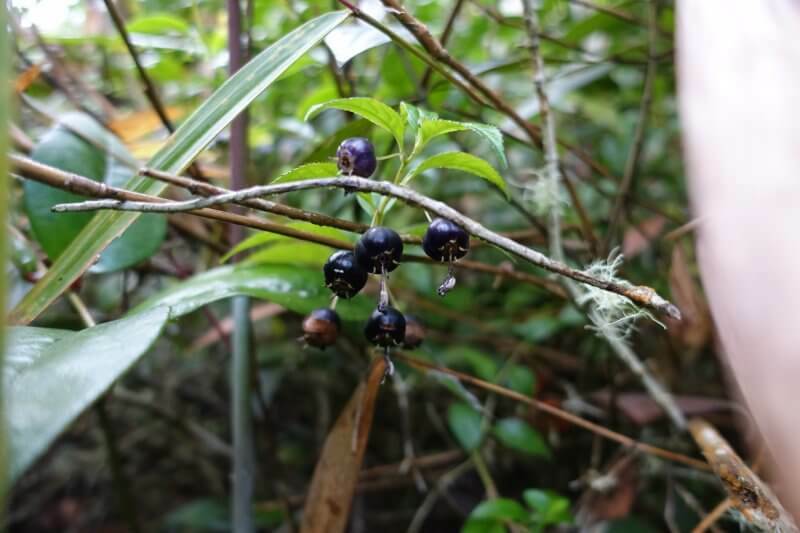 As mentioned earlier, the geography of Berastagi makes the area very suitable for growing a variety of crops that are not normally found in the tropics. 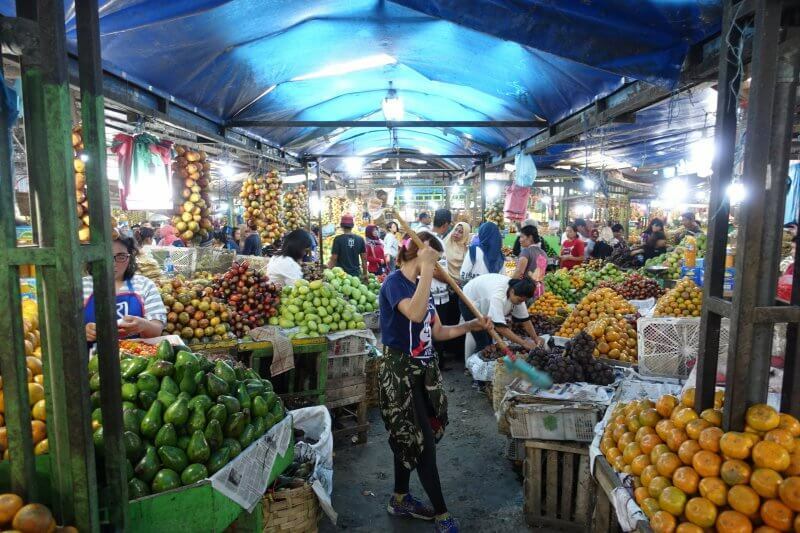 One way to make the most out of this, as a tourist, is to visit the local fruit market, in the center of town. 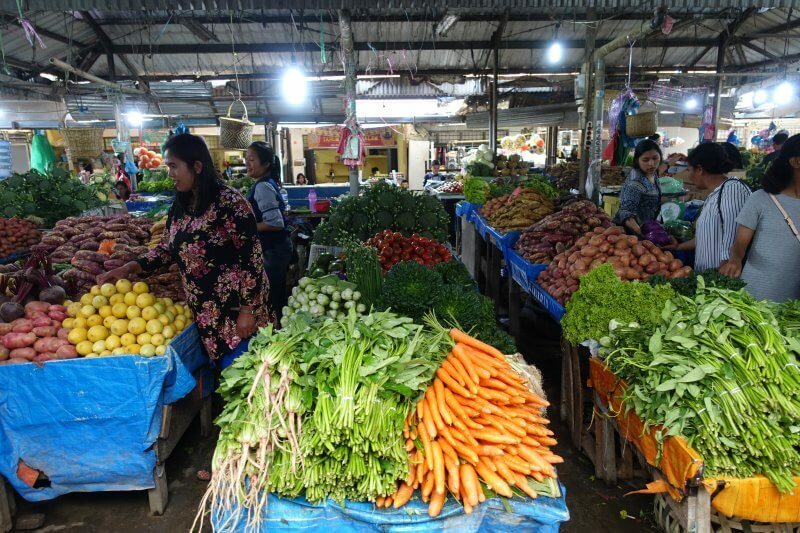 The explosion of colour from the variety of fresh fruit and vegetables is captivating. With so many options, it may be a good idea to look around to ensure you’re getting the best deal. Fresh fruit at Berastagi Fruit Market. Avocados! 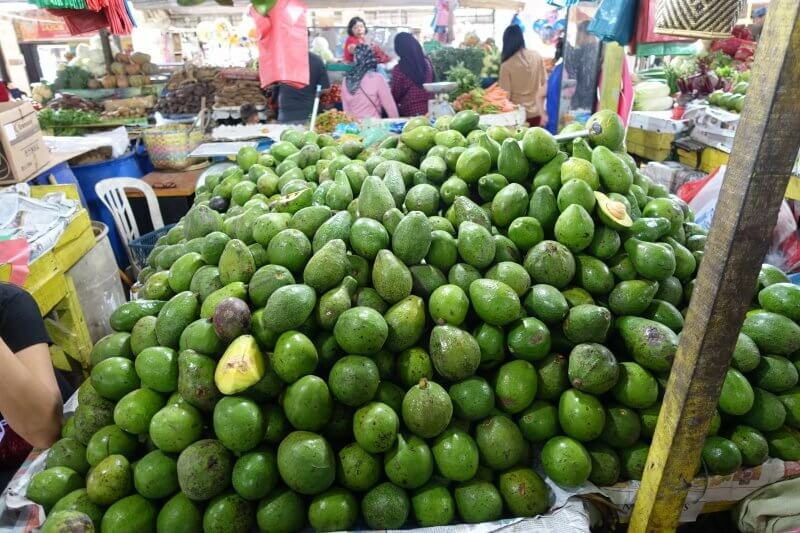 If I did not overhear the price wrongly, a kilogram of avocados here are going for the price of a single avocado in Singapore. 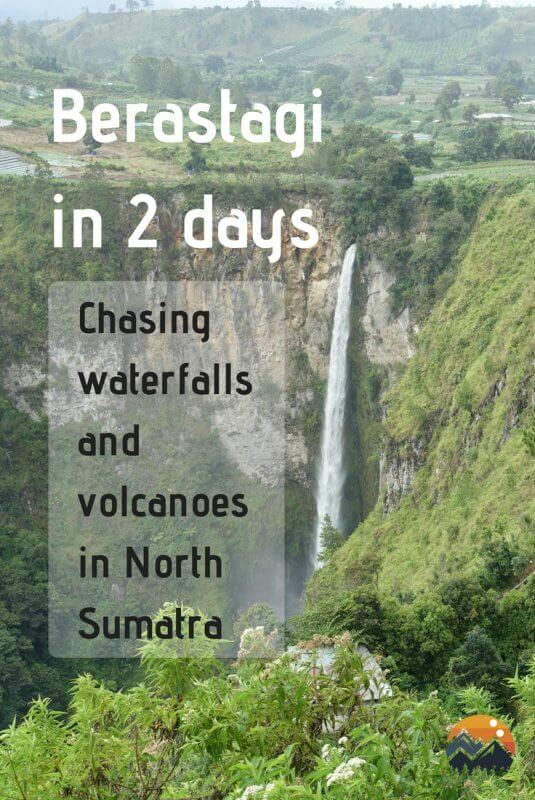 Our final challenge at Berastagi was getting out of it. From the instructions we gathered we anticipated an easy time walking to the gas station at the roundabout, then boarding the next bus stopping there, getting to Medan for 10,000 IDR per person. Probably because of a peak travel period, reality was less easy going than we envisioned. The first part was alright, waiting for transport outside the gas station at the roundabout. There were other people queuing too. Many vehicles stopped by to pick up passengers going towards Medan, and one of the guys managing the distribution of passengers to transport (or touts?) ushered us towards a small van. We were apprehensive as the price quoted was higher than expected and we were told the bus would be the preferred mode to Medan, so we held out for the next one. 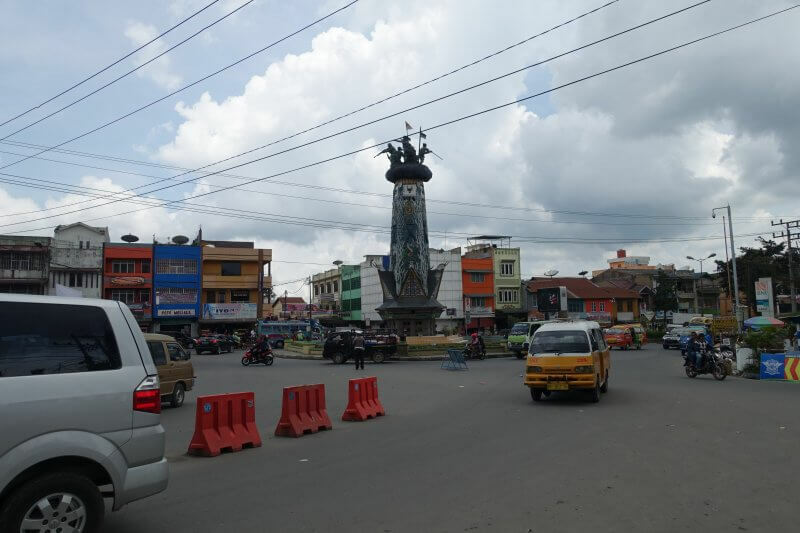 The roundabout to wait for transport from Berastagi to Medan. The bus finally came, and the crowd surged forward, filling the bus to the brim and eventually taking out the top too. We stood there, stunned. Weren’t quite prepared for a bus-top ride through the winding mountain road. 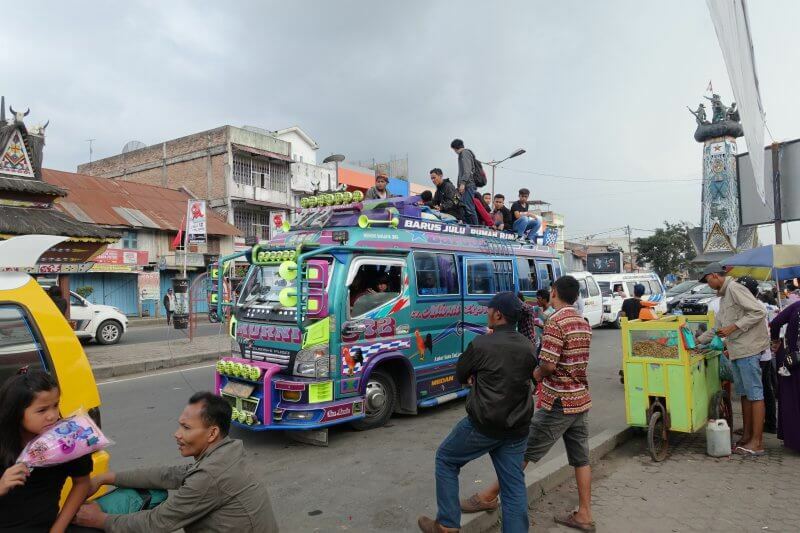 Every single vehicle that stopped left packed, and we resigned to the fact that this ride to Medan isn’t going to be as straightforward as it set out to be. Eventually, we got to the back of a pickup truck (15,000 IDR) that was packed to the brim, like sending pigs to the slaughter. Buses packed to the brim, literally. With just enough room to hug my legs at the back of the truck throughout the 3 hours it took to get to Medan, we were just glad it did not rain throughout that time, especially since it rained every afternoon since the day we arrived in north Sumatra. With every sharp turn we held our breaths and hope we didn’t crush our neighbours too much. Finally we arrived in Medan and gladly swapped our truck ride for a Grab one. Feeling a little tired and sore, it was time to get ready for the last leg of our north Sumatra adventures of April 2018, Medan!